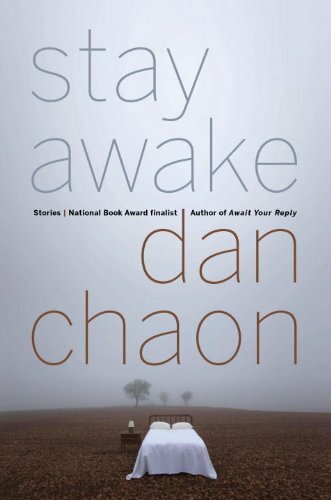 Recollections of spousal abuse, a double suicide, traffic accidents, traumatic brain injury, an infant born with a parasitic twin conjoined at the head, a kidnapping, and a few murders are but some of the traumas in whose wake Dan Chaon’s—mostly male, middle and lower-middle class, Midwestern, young adult to early middle-aged—characters struggle to regain emotional stability in Stay Awake’s dozen grimly realistic stories. and in “The Farm, The Gold, The Lily-White Hands” three adult sisters, who are haunted by their girlhood memory of the night their estranged father came to the house intending to kill them but murdered their mother instead, try to come to terms with their loss. This last story has a beautiful lyrical tone; with its occasional sentences that end with a space instead of a punctuation mark and paragraphs that begin with a lower case letter it is the most formally experimental story in the collection, and its Thomas Carlyle quotation and the extended metaphor derived from that quotation make it the most literary. Although the catastrophes differ, the characters’ thought processes and responses to the disasters are similar, as is the tone and tenor of the prose throughout the collection with the already noted exception of the final story. While some stories are told in the third person while others are in the first, and most reflect the male point of view though a few are from the female, Mr. Chaon’s voice comes through them all. The author seems to be working out personal issues through his characters, some of whom question their own reliability and grip on reality. Like some of his characters, Mr. Chaon grew up adopted and is a widower. His readers can only guess the adversities he has endured and, should he ever write a memoir, whether it would be as compelling as his fiction. Highly educated solidly upper-middle class readers who have lived relatively charmed and fulfilling lives will probably find the violence in these stories shocking and disturbing. Compared to themselves and their bicoastal peers such readers may find these characters from the flyover states lack judgment, keenly focused intelligence, and have difficulty understanding cause and effect or anticipating the consequences of their actions, much less thinking two or three moves ahead on the chessboard of life. But unless they have lived through traumas similar to those described in Stay Awake such readers would be wise to reserve judgment. The stories remind us that tragedy can strike anyone at anytime, and those struggling in its wake sometimes don’t exercise good judgment. And yet these rustbelt characters aren’t just anyone; many of them lack the intellectual skills to thrive in our post-industrial/information age/digital economy, a handicap that increases the likelihood that they will find themselves in the path of life’s calamities and renders them less resilient and resourceful when disaster strikes. Interesting note: In a book about traumatized characters struggling to emotionally recover there is not even one psychotherapy scene. Readers who enjoyed Mr. Chaon’s previous collections of short fiction, brace yourselves for this new volume’s darker tone, but the quality of its writing will keep you glued to the pages. Stay Awake is recommended to all readers who enjoy short form psychologically perturbing fiction.